As artificial intelligence is partially contributing to business processes, the banking industry is not far behind. The rise of artificial intelligence, in many ways is a perfect accomplice for Fintech. AI represents an immensely exciting platform and framework, inside which all sectors have new potential to interact and serve their clients and counterparties. To simply define it, artificial intelligence is the science of making machines do things that would require intelligence if done by man. The extensive variety of emerging AI solutions in the BFSI industry have the potential to process high speed and high volume data through cloud computing and advanced deep learning techniques. AI comprises of a set of technologies and not just a single product or framework. The most famous proposition is that of instructing machines to learn and interact to solve cognitive tasks normally which are otherwise done by humans. The implications extend to computers resolving problems, reasoning, processing natural language and much more. This progress in AI technology is also accelerated by immense volumes of data from clients and market players with the digitalization of financial services - banking, insurance and trading. One would now be able to plunge into over 10 years of banking, insurance, mortgages and financial trading history for each and every transaction of the million exchanges that occur day by day. This information could then be applied to deep learning, therefore constructing applicable algorithms that offer insight, improve decisions, mitigate risk and detect minor to major error patterns to counteract frauds or disasters. 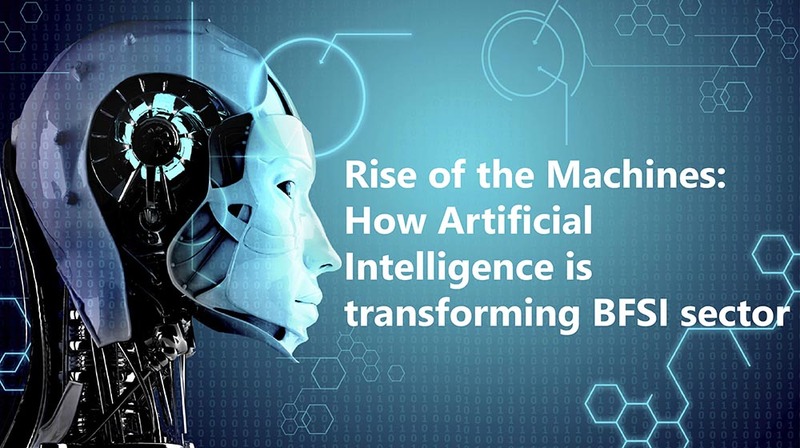 AI technologies are presently being applied by the BFSI industry in the areas of knowledge management, identity authentication, market analysis, CRM, anti-money laundering and risk control. To leverage AI, banks are aggressively hiring statisticians and data scientists, who investigate new uses of data across the banking and financial services sector, aiming at better administration, customer service and profit. The market space is getting swarmed by AI organizations occupied with bot messaging/support, document discovery, basic machine learning, voice analytics, crawling techniques and generic algorithm based trading. Deep learning and real time data analytics are progressively on the rise. Financial services organizations are aggressively tracking AI technologies to plan future initiatives. Organizations are discovering and implementing innovation with venture capital and captive incubators to develop and deploy new innovations. With the rise of automated services, AI and robotics are convincing conventional banks, financial services and payment providers to work closely with designers, coders, engineers and marketers to identify new ideas and market them. Financial Services organizations declare war on hackers investing millions of dollars towards AI integration to offer security against fraud and theft that helps build a sustained and transparent relationship with customers. Nonetheless, it ought to be perceived that, the take-up of AI within financial services is driven by clients. Firms and institutions have minimal decision. AI can possibly change the way organizations work across all sectors in the economy, and finance is at the front line of this change. Both existing organizations and startups that are looking to innovate and keep up with competition and technology need to be aware of the legal and regulatory implications they will face while implementing these new technologies and how they can moderate the key dangers which emerge.